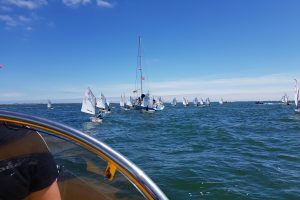 It was a weekend of everything in Dunmore East, where 26 of our sailors headed to the purported sunny South East for the 2017 Connaught Regional Championships. The forecast for Saturday always showed breeze, and the strong SW met a tide coming out of the Waterford estuary which stood up a very large swell. All that was manageable until the fog rolled in, and with the Junior fleet in sequence for the first race, the PRO (Royal Cork’s Richard Leonard) was forced to postpone and send the fleet ashore. No sooner had the last of the fleet hit the slipway, the fog lifted somewhat and another attempt was underway. The respite was temporary, and to the disappointment of some of our sailors who were revelling in the lumpy, breezy conditions, the race was abandoned at the first weather mark. The safety and support boats swept through the course in visibility of 300 yards and less to ensure all competitors were homeward bound, and the scoreboard remained empty. Meanwhile, some of our Oppie parents were running on the new Waterford Greenway in glorious sunshine! A fantastic barbeque was hosted by WHSC that evening. Regatta fleet had a little more luck, sneaking in a quick 2 races in the cove before they too fled from the worsening weather. The forecast for Sunday was hopeful, but the fleet awoke to slightly misty conditions. The NW breeze was much lighter, and as the sea breeze built, it worked to kill the gradient over the course of the first 2 races. The sea breeze finally won over about 1400, prompting a mad scramble to re-orientate the course through 180 degrees and get a third race in (and a series) before the time limit expired. 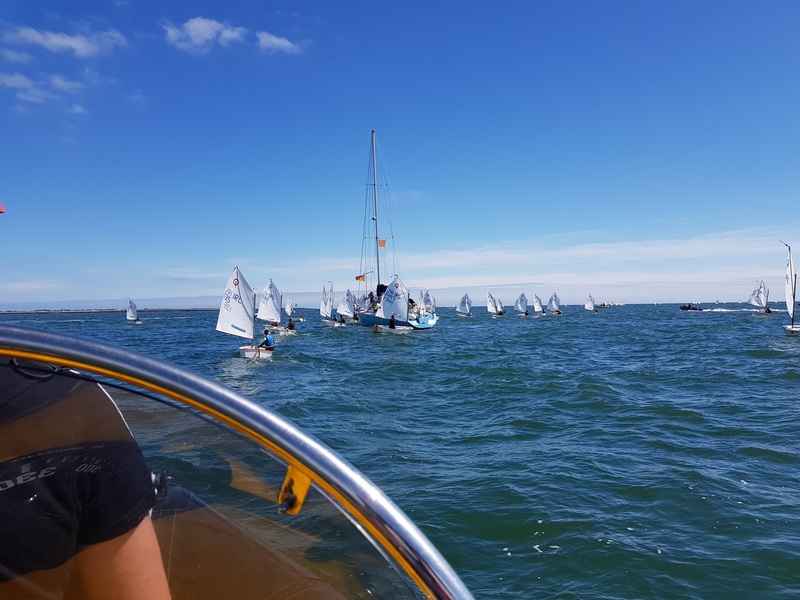 The 3rd and final race of the day was sailed in magical conditions – twinkling seas and glorious sunshine, with a classic 10-12 kts of sea breeze. The Royal Cork fleet acquitted themselves superbly once again. In Senior Fleet, Alfonso Moreno Perez took the Gold Fleet trophy, with Cillian Foster sailing well to finish 3rd. Rory O’Sullivan and Michael Crosbie completed our Top 10 finishers in 5th and 9th respectively. There followed a cluster of club sailors – Richard McSweeney in 11th, Jamie Venner 12th and Eoin Horgan in 13th. Neil O’Leary came in 21st (taking Silver), Eva Spillane 29th and Dara Collins 31st. In Junior Fleet, Simon Pritchard was best placed in 6th, beating Anna Keal (who also took first girl) on countback. George Pritchard had a superb day out, finishing 10th and counting a 3rd in his scores. Emmet Lucas and James Murphy followed immediately after. Lucy Bateman finished 17th, Rian Collins 22nd and Ben O’Shaughnessy 23rd with an unfortunate DSQ in Race 3. John Neville in 28th and David McSweeney in 34th completed the Royal Cork fleet. Regatta Fleet saw 2 of our sailors in the top 5 – Harry Moynan in 3rd and JP Curtin in 5th. Julie O’Neill was close behind in 7th (2nd girl), chased by brother Andrew in 8th! Charlie Venner came in 11th, and Shane Collins in 15th. Meanwhile, many of our sailors were on international duties – a big shout out to the IDT France team members of Kate Horgan, James Dwyer Matthews, Harry Pritchard and Eimear McMorrow-Moriarty, and of course those on the Worlds team in Thailand, Justin Lucas and Harry Twomey, who tore up the team racing form book with a tremendous 9th place and are delivering well in very tough conditions in their individual endeavours. Well done to all our sailors, with the next circuit event being the Nationals in August. 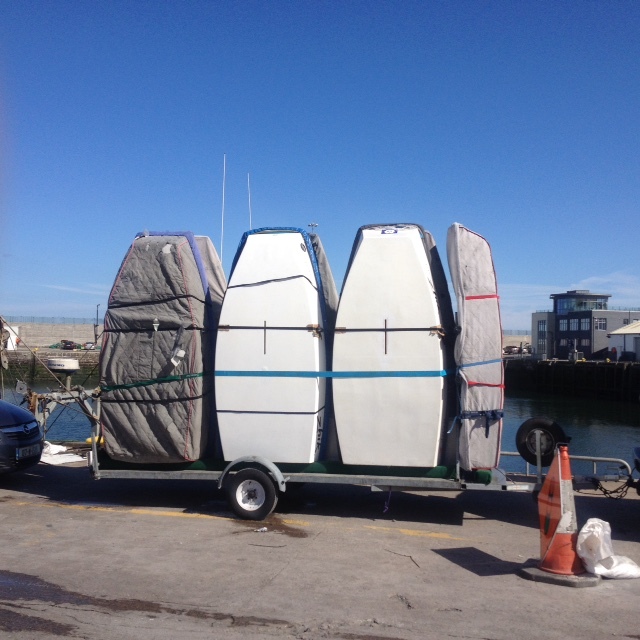 Team Royal Cork locked and loaded for home – thanks to Ciarán for towing.